Take part in the Raid To Livewell! 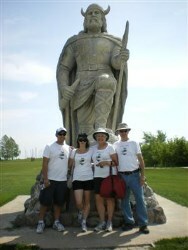 On July 27, the 2013 Stroll for Liv­er will have a Viking theme! Col­lect your clan, col­lect your pledges and be pre­pared for Viking war­rior games. We encour­age teams to get in the Viking spir­it. Your team could have a unique clan call, cloth­ing dress or sym­bol. Sign up today to spend a fun day in Gim­li with many oth­ers who care about those liv­ing with liv­er dis­ease! Pledge to raise mon­ey for impor­tant research and patient sup­port! Reg­is­tra­tion starts at 10, War­rior Games and Scav­enger Hunt at 10:30, with Lunch & Prizes to fol­low! Reg­is­ter today for the 2013 Stroll for Liv­er, a fun sum­mer day at the park and on the beach for a great cause! Vis­it stroll​for​liv​er​.ca for more information.